Quick and slick and mostly non-stop, but with something for the big boys, too. 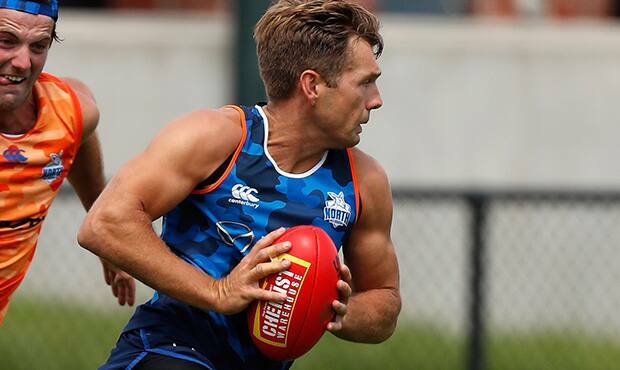 The AFL's mysterious abbreviated game, aptly named AFLX, made a low-key appearance at Arden St on Friday as North Melbourne turned guinea pig in torturously hot conditions. The Kangaroos also trialled the format last year, but this time it was an audition ahead of the first official AFLX tournament in Melbourne, Sydney and Adelaide from February 15 to 17. Few fans braved the heat to get an early look, although two of North's stars on the day, club champion Shaun Higgins and Shaun Atley, gave the thumbs up. Three teams of 12 Roos, with either eight or nine on the field – more than the allowed seven in AFLX – rotated across nine 10-minute contests. Atley is the AFLX archetype: fast, bold and elusive with a decent fend-off. The likes of Dustin Martin, Patrick Dangerfield and Jarman Impey are going to love it. Atley's damaging runs through the middle were as much a theme as Braydon Preuss' long bombs – the coaches gave him a licence to unleash – and Higgins' clean skills and suave decision-making. "That's my sort of game, taking the game on and running, so it does definitely suit that," Atley told AFL.com.au. "But there are plenty of guys out there, like Higgo and Luke McDonald, who have taken really well to it. "It's a bit different to the usual game we play; it's a bit faster and more free-flowing. But it's good for the fitness at this time of year." Higgins, who put his hand up to play in the round robin series in mid-February, offered fascinating instant insight into the differences from the long-form game. He estimated he ran up to 10km across his six matches, astonishing numbers given the intensity was higher than a typical game and play was continuous with the last-touch-out-of-bounds rule. "It's funny, because last year we thought it was purely the running sort of player (that AFLX suited), but I think the skills are really important," Higgins said. "We saw some of our big guys today have really good games and affect the game, because we were able to hit-up as well and take marks. "At the end of the day, it's still footy, so the best players will be the best players at AFLX." Higgins highlighted defender Scott Thompson kicking four 'super goals' – 10-pointers from beyond 40 metres – as proof that "anyone's in the game at all times". Jarrad Waite had a highlight-reel moment when he rode a teammate for a high mark, while Ben Brown was largely unstoppable close to goal. Brown even found himself out-marking the much-smaller Alex Morgan at one stage, such is the scattergun nature of the game and high likelihood of mismatches. What made for good viewing was the preference to attack through the corridor. No.4 draft pick Luke Davies-Uniacke, as he has all pre-season, fitted in wonderfully and showed some impressive glimpses, while Mason Wood, McDonald and Morgan also shone. The players ducked inside their Arden St headquarters to escape the heat after their two-game rotations, while Jamie Macmillan and Ryan Clarke left the field with respective injuries. Macmillan rejoined the game play, whereas Clarke's knee problem was late in the piece and two trainers helped him off. 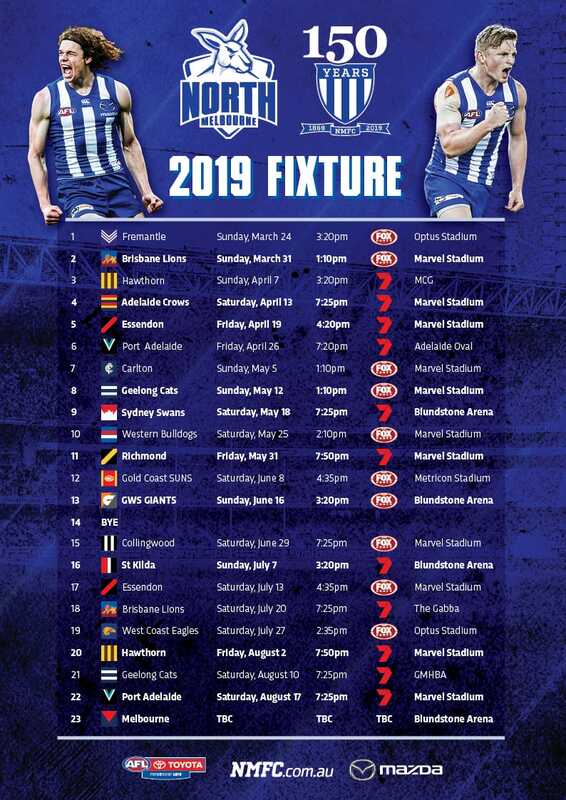 Higgins expects North Melbourne and rivals to treat AFLX as seriously as any other pre-season contest, with the opportunity for players to push for senior selection. As for Atley, he sees potential in the new game. "It might take a bit of time, but it's definitely something the fans will enjoy if they can get along to it and watch it," Atley said. "I reckon it's got plenty of room to grow."